Currently, around 35 percent of males and 6 percent of females around the world smoke tobacco. The percentage of adults worldwide who smoke tobacco has decreased in recent years and is expected to continue doing so. By 2030, it is estimated that 17 percent of the global population will smoke tobacco, compared to 21 percent in 2015. Awareness of the dangers of smoking, costs, and targeted policies and campaigns have all contributed to this decrease. As of 2016, a high percentage of the world population was covered by some form of tobacco control policy to varying degrees. The United States consumed around 267 billion cigarettes in 2015. In 2016, some 37.8 million adults in the U.S. were current smokers. Men are more likely to smoke than women, with some 19 percent of adult U.S. men reported to be current smokers, compared to about 15 percent of U.S. women. American Indians and Alaska Natives are the ethnic groups with the highest share of smoking adults. Since the late 90s, smoking among adolescents has steadily decreased. Nevertheless, smoking does not come without problems. Smoking-related costs for the United States amount to over 300 billion U.S. dollars. One half is for direct health expenditure, while the other is due to lost productivity. Furthermore, the health risks of smoking are well-known. For example, the prevalence of heart diseases and various types of cancer increase dramatically when people start smoking. Most of the U.S. states with the highest smoking rates also have the highest cancer death rates. This is no wonder, since cancer of lung and bronchus are the most prevalent cancer types. It is also a given fact, that secondhand smoke can have the same increased health risks for nonsmokers. 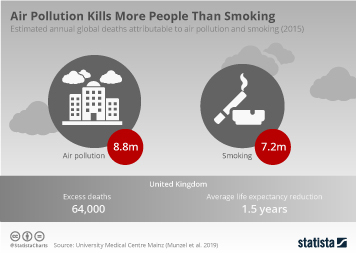 Due to all this, countries increasingly attempt to ban smoking from public facilities and places and use other policies to encourage people to quit smoking. In the United States, almost 80 percent of people who smoke less than one pack a day want to stop smoking. Most smokers try to quit unaided by outside help, however the use of e-cigarettes is becoming increasingly popular, either to quit tobacco altogether or to replace traditional cigarettes. There is however a dilemma, since governments all over the world generate considerable revenues from tobacco products. These amounts are distinctly larger than expenditures on tobacco prevention.